Using only one pot, this quick and easy dish is ready to eat in under 25 minutes. This recipe is suitable for both vegans and vegetarians if using vegetable rather than chicken stock. In a pot, make a background of olive oil, fry the garlic until it’s golden, add cebolo/onion and cook for 3 minutes on low heat. 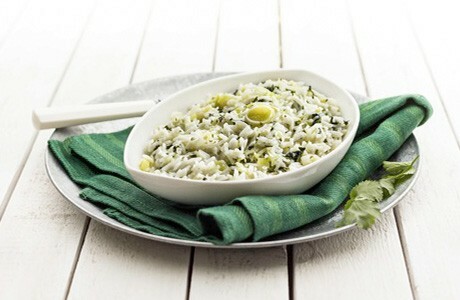 Add the chopped coriander and rice, mix well and add three times the water as rice. Season with salt to taste. When the water is boiling add the broken broth, stir well and cook on low heat for about 15 minutes. Serve immediately.